Located in the exclusive Riviera Maya on the Caribbean Sea, 35 minutes away from Cancun’s International Airport, and 45 minutes from Cancun’s downtown. Cancun’s International Airport is located 20 miles from the Hotel. Exit the airport and turn right on Highway 307 heading to “Playa del Carmen”. After passing “Puerto Morelos” (10 minutes) on your left you will see the impressive Mayan Arch welcoming you to Mayan Resorts Riviera Maya, where The Grand Mayan is also located. 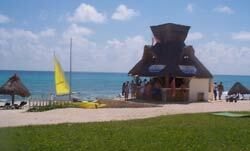 The Riviera Maya is an extensive region and a car rental is recommended.